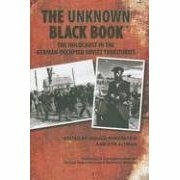 The Unknown Black Book provides, for the first time in English, a revelatory compilation of testimonies from Jews who survived open-air massacres and other atrocities carried out by the Germans and their allies in the occupied Soviet territories during World War II. These documents, from residents of cities, small towns, and rural areas, are first-hand accounts by survivors of work camps, ghettos, forced marches, beatings, starvation, and disease. Collected under the direction of two renowned Soviet Jewish journalists, Vasily Grossman and Ilya Ehrenburg, they tell of Jews who lived in pits, walled-off corners of apartments, attics, and basement dugouts, unable to emerge due to fear that their neighbours would betray them, which often occurred.